Mirrored Skirts. The hand embroidered mirrored trim flashes fairy lights over the stage, dancers, and audience. The extra weight at the hem takes vertical spins to the max!. 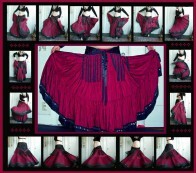 These skirts inspire special choreography and have thrilled even the most experienced dancers!